This July, Germany will host the twelfth annual G20 summit. Its message of global neoliberal rule will be met by mass protest. From July 5-8, Hamburg, Germany will host the twelfth annual G20 summit — and along with it, the twelfth annual G20 protest. The heyday of summit protests has passed, but such gatherings continue to galvanize resistance movements. And rightly so: the G20 summit is a gathering of the leaders of nineteen mostly arbitrarily selected countries, plus the European Union, which, with no political mandate, take it upon themselves to plan the future of the global economy behind closed doors. Julia Damphouse, a Canadian activist and student in Berlin, spoke with Emily Laquer from the #NoG20 campaign for Jacobin. What is the G20? What will be discussed there? What has this group of world leaders done in the past that’s so bad? The annual G20 summit was launched to stabilize the economy after the financial crash in 2008. It’s a meeting to bring together the world’s nineteen wealthiest countries to manage a world in disorder. It’s a question of democracy: rich countries shouldn’t decide the fate of the poor behind closed doors. G20 member countries account for 85 percent of the world’s GDP, leaving out most countries in the Global South. There is an overarching question about the legitimacy of the leaders present and whose interests they serve. Trump doesn’t represent the majority of the American people, for example; Recep Tayyip Erdogan’s dictatorship in Turkey didn’t come by fair elections. And then there’s the purpose of this meeting: to stabilize capitalism at a time of crisis, or at least give the impression that capitalism will survive and the G20 leaders have got everything under control. The reality, of course, is that their economic systems are responsible for the greatest injustices of our time: poverty, war, climate change. This year’s summit is going to be the stage for a battle between protectionism versus transnational capital, i.e. Trump or Theresa May versus Justin Trudeau or Angela Merkel. If we succeed with our mobilization, it will be a stage for the anticapitalist opposition, too. How did you first get involved in the G20 protest movement? And why is this year’s protest so important? I became an activist during the G8 summit protests in Germany in 2008. It was an incredibly powerful experience for me and one that changed the way German radicals organize today. The financial crisis of 2008 reconfigured the global political landscape. It gave rise to the neofascist developments we witness today, from the Turkish referendum to Donald Trump or the significant popularity of ultra-right candidates in the Netherlands, Austria, France, and even Germany. The neoliberal status quo is threatened by neofascist attacks. This conflict is a crucial test for the survival of the European Union. But the Left is utterly on the defensive. This is our opportunity to unite as a trans-European and global movement against false solutions and to push our struggles forward. Can you go over some of these different demonstrations taking place July 5-8 and the significance of each? We will block the summit on July 7, much like we blocked the G8 summit ten years ago. G20 really is just a PR event, and we’re going to make sure that while the world is watching, thousands of protesters will be circling, making it really difficult to get anything or anyone in or out. Block20 will probably be the largest of the civil disobedience actions, but there’s going to be an entire week of events. On the evening of July 7 there will be a Night Dance Demonstration, in which people plan to take radical parties to the streets. The Global Solidarity Summit on July 5 and 6 is going to be a space to network, discuss visions and strategies, and bring a broad range of progressives together. “Welcome to Hell” is going to be a huge autonomous demonstration (autonomous culture has a long tradition in Hamburg). Others are planning to engage in a blockade at the Hamburg Harbor, and students are also planning to go on strike during the summit. Lastly, our “Solidarity Without Borders International Demonstration” on July 8 will bring us all together for the largest mass demonstration of the week. The #NoG20 Protests could quite possibly be one of the largest movement events for Germany in a decade. The 2015 and 2016 G20 summits were held in Turkey and China, respectively, making protest actions more difficult because of the political repression in both countries. The politics of the host country can have both a symbolic significance and a practical effect on the ability of organizers to build mass resistance. What is the significance of the conference being held in this year in Germany, given its current role in the European Union? Germany has an image of being quite liberal or progressive, especially in comparison to Erdogan, Trump, or Le Pen. But we need to avoid the false narrative of Merkel as the last woman standing as leader of the free world. In a way, Merkel is Europe’s Hillary Clinton. She portrays herself as the liberal voice of reason, but in reality, her neoliberal agenda is a big contributor to the rise of neofascist popularity. Germany is a leader in pushing austerity measures upon Europe and upholding the EU border regime. Germany’s EU policies, and especially the deal with Turkey (in which Turkey patrols the borders and prevents refugees from entering the European Union in exchange for millions in financial assistance) is one of the reasons that five thousand refugees die while crossing Mediterranean every year. There is an urgent necessity to organize and overcome the fragmentation of the European left. Hamburg is the place to do just that. There are over a dozen different groups involved in organizing the events of the week. You are a member and spokesperson of the Interventionistische Linke (Interventionist Left), and Attac, an “alter-globalization” network, is also present. What are some of the other groups that have been involved, and what roles various activists groups are playing? There will be numerous players, from nonprofits and foundations, Die Linke and the Communist Party, Christian communities, civil society institutions, grassroots movements, student and activist groups, and radical networks. People are organizing regionally and will be arriving in buses from all over Germany and Europe. There’s even going to be a chartered train with a thousand seats for protestors traveling from Switzerland. Our international friends are mobilizing as well — Sweden, Italy, Greece. It’s impossible to name them all. The summit will take place in St. Pauli, a part of town known as a home to many leftists. The local community soccer stadium is notorious for its radical fan base, and they plan to host the activist media and convergence center in their stadium during the protests. Many locals are organizing as well. Have any tensions come up between different organizations involved over tactics or where to focus the resistance? Our goal is to build a massive opposition to neoliberal rule and its new ultra-right opponents. This is why we accept and welcome various social movements and organizations despite our differences in strategy. Hamburg is governed by a coalition between the Social Democrats and Greens. For them, of course, it’s quite a dilemma to be hosting this summit, simultaneously enacting countermeasures against protesters by condoning “protest-free” zones (we like to call them “democracy-free zones”) and heavy policing within the city while trying to uphold their democratic image. They’ve even announced their own rally for “peace and human rights.” It’s pretty absurd. The intention to demonstrate was announced officially back in November. Since then you’ve organized Action Conferences and actions in various German cities. Jane McAlevey has stressed the importance of deep organizing: building a broad base of support, commitment, and organizational competency, as opposed to just mobilizing existing support. She is focused on the labor movement, but the decision of what type of engagement to focus on is faced by all kinds of movements. To what extent are these training weekends part of a larger strategy to train new organizers and keep them involved over the long haul, rather than simply mobilizing for a one-time event? We don’t provide any formal training except direct action workshops. Our “boot camp” is participation in our struggles, and we welcome everyone to join us and jump right in. There is so much to learn just by becoming part of a movement. You can knock on a thousand doors, and that’s important. But there is a certain kind of empowerment you can’t learn other than by experiencing it through mass marches and collective disobedience. We prefer educating through activism instead of with trainings. However, some activists in Germany are very interested in US concepts of community organizing. The debate on mobilizing versus community organizing is a hot topic for the Interventionist Left, as well. We need it all: we need to build strong relationships in our communities, but we need to mobilize an uprising, too. 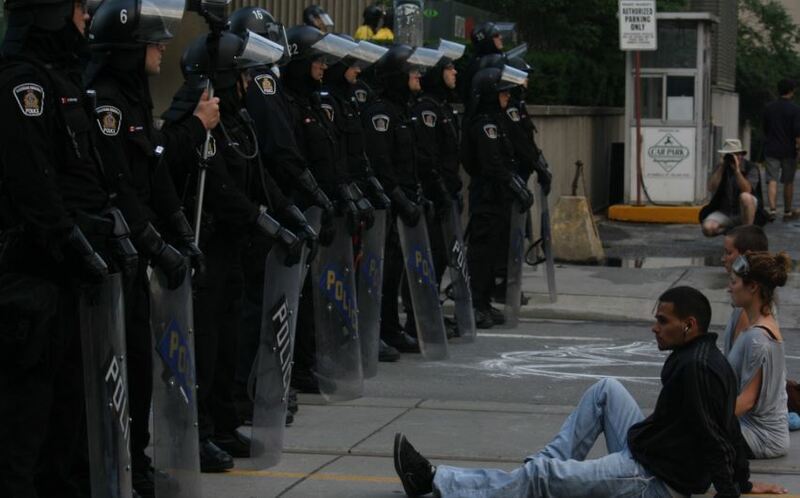 The history of militant action at G20 and G7/8 summits (like the 2010 G20 summit in Toronto, which saw the largest mass arrests in Canadian history, with over one thousand people detained) shows that there is a population of dedicated activists willing to put their bodies on the line, despite police repression. The same is true of the mass mobilizations against the summits of organizations like the World Trade Organization and various free trade deals like the Free Trade Area of the Americas in the 1990s and 2000s. I’ve been keeping up with the preparation on social media, so I have to ask: what’s up with all the pictures of toothbrushes? A few years ago, during an ongoing conflict between the police and activists over the eviction of a left-wing cultural center, the police made up an attack on a Hamburg police station by radicals. It turned out to be entirely false, but during the months that followed, “dangerous zone” laws were installed in Hamburg, giving the police more rights to stop and frisk and terrorize migrant communities in particular. Leading up to the G20 summit, we anticipate a broad attack on civil liberties. Many people are rightly worried, since the police chief for the G20 protests is known for hating the Left and applying unconstitutional tactics against them. The toothbrush is a symbol to remind us of how we reclaimed the city with a toothbrush. We hope it will encourage and remind all of us: this is not the time to stay on your couch and mourn the state of the world. It’s the time to unite in our struggles and take to the streets. We urgently need to organize and mobilize a global opposition. We come prepared; should the police arrest us, we’ll have our toothbrushes in jail. For anyone considering coming, there will be protest camps to stay in inexpensively, we’ll provide English translation and legal info. And there will be tons of international guests. If you’ve ever thought about visiting Germany, now’s the time. Emily Laquer is a member of the Interventionist Left and spokesperson for the G20 mobilization. Julia Damphouse is a Canadian activist and student in Berlin.